‘There’s something dripping in my head. A heart. A heart in my head.’ The stage for the opening night of Endgame at Glasgow’s Citizens Theatre is set with muted, washed out hues – mirroring the colour gradually draining from the play’s enigmatic characters. And looking down at the stage, its convex shape exaggerated from our high seats, the set is softly lit with a hazy grey spotlight. Endgame consists of a bare room with a wooden floor, two murky green windows, one door leading off stage, a painting on the wall, Clov standing in the corner and his blind and crippled father Hamm sitting in a wheeled-armchair, and two dustbins, which are home to old legless Nagg and Nell. And when I say ‘legless’, I don’t mean they’ve had one too many drinks and ‘needed put in the bin’. I mean literally legless. And so, the stage is set, like the inside of a hollow skull, and Beckett’s one-act tragicomedy begins with Clov’s ironic opening line: ‘Finished, it’s finished’. 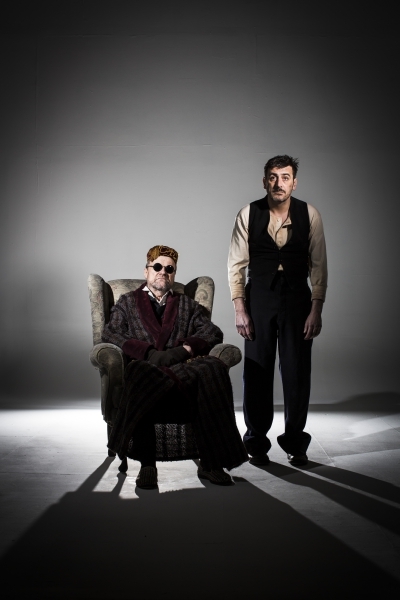 Directed by Dominic Hill, this renewed interpretation of Beckett’s modern classic sees David Neilson (Roy Cropper) as Hamm, and Chris Gascoyne (Peter Barlow) as Clov. The duo, most commonly known from the cobbles of Coronation Street, adapt into Beckett’s absurdist and morbid alternative reality with ease. Gascoyne, known for being the Corrie bad boy, effortlessly morphs into a hunched over, stiff, pained Clov who laboriously hobbles around after the father he loathes but, for some reason, can’t bring himself to leave. Similarly, Neilson, who we know as Corrie’s incomparably sweet and gentle cafe-owner, embodies the character of the snarling, cruel and commanding, yet helpless, Hamm like he was the character Neilson was born to play. With theatre and TV actor Peter Kelly, and Barbara Rafferty (Ella from Rab C Nesbitt) as the macabre but borderline adorable Nagg and Nell, Endgame comes to life (or perhaps ‘death’ would be a more appropriate word) as the festering couple with sore stumps where their legs used to be talk about over-told funny stories that don’t make them laugh anymore, try to kiss but can never reach each other over the rim of their dustbins, and, surprisingly, give the audience many sadistic but thorough laughs before they crumple into their squalid bins to die. The existential, self-reflective, receding circular (lack of) plot of Beckett’s post-modern masterpiece has kept audiences confused, disturbed, entertained and gripped for decades, with its momentum showing no signs of letting up. Many literary critics have tried to decode Beckett’s cryptic work, with some interpreting it as a tale of deterioration and death in the form of a chess game as the title suggests, and others arguing that the characters in fact represent the dying cells of a demented brain. The answer to Beckett’s obscure formula is yet to be found, but the mystery only seems to be bringing more punters to the box office, and the play’s cult following is continually growing.